"The more I travelled, the more I realized that fear makes strangers of people who should be friends." On Monday we drove home, away from our friends and back to our ordinary life. As we travelled South we noticed something up ahead on the road. We were forced to slow slightly, then to a barely discernible crawl, and then stop entirely. The freeway was at a standstill, that was soon clear. Cars were not simply idling: one by one people began to emerge from their vehicles, to walk around, to stretch their legs and in one case, to give their dogs some exercise. As people began to wander about, more were inspired to do the same until the road resembled a busy meeting place. Somebody close by said they thought the traffic was halted for a length of fifteen miles. Gossip swept along through the chain of cars with a fervour. As I mused on the peculiarity of wandering on a road we usually identify only as a grey blur, the woman in the neighbouring car asked Spouse and I if we knew what the trouble might be. Of course we did not have a clue but she gave up hoping we would soon start moving again, stepped out of the car and started to talk to us about where she had come from, where she was going. She asked us if we were going home. Her young granddaughter poked her head out the window and updated us several times that she had heard a whisper there was an accident, she had heard somebody say we would be trapped for hours. The chirping child had particularly good ears for picking up the news on the air and her grandmother remarked that the child inside the car knew more than she herself did while standing on the road. I mentioned to the very friendly lady that we had sausage bread, a fresh trout and a chive plant in the back of our car and joked that at the very least, we would not be hungry. Our neighbour suggested that it was far better to be at this part of the accident than actually involved in it- a sobering thought which, despite the obvious common sense of it, had not struck Spouse and I until it was said. It made the waiting a good deal easier. As we stood there, grateful for the sky that held its rain, glad to be safe, the crowd watched as one driver decided that his time was too important: he jumped into his car, drove off the road, dragged the vehicle over the grassy verge between two freeways, almost sank twice in the swamp he had not guessed at, and finally pulled himself out to get back on the road on the other side- not only a completely illegal endeavour but a dangerous and thoughtless one. As he sped away in the opposite direction we heard a dreadful bang and a clatter; something had gone awfully wrong with the car and no doubt he would pay for his haste. We were all in the same boat, all having to wait and make the best of it, all wanting to be on our way but not so troubled that we could not make time to share a few comments with fellow travellers otherwise unknown and passing like ships in the night. After about twenty minutes, one young fellow nearby brought forth a guitar from the back of his car and I am sure that we would have been entertained musically had the word not trickled slowly down that traffic was beginning to flow again. We all said our goodbyes and made our way onwards, relieved that our precious food would not be spoiled and in some way pleasantly surprised by the encounter and the brief interaction that was so unexpected. So this time, did the sausage bread make it all the way home? Barb, that's a very, very good question. this story reminds me of so many car trips taken in maine and in new england on holidays!! how nice that someone with a guitar came out to entertain. sausage bread is mighty tasty! Texican, When I'm reading I appreciate stories in which narrators describe their routine in making food- I've bought many a book based on the main character sitting down to a grilled cheese sandwich and a bowl of soup ;) I love food, as you do, and love to read about it too. Your bean soup and sausage sounds like a super meal. Kimy, I think we were shortchanged! I wanted music! :) But I was worried about the trout. We didn't even have a cooler, just a milk bottle filled with ice and water. And I thought traffic was bad where I live. Sounds like you made the best of it anyway. I bet that sausage bread didn't make it home again. Hi The, You have been nominated by me as one of the five blogs that make my day. Please go to my site for more information. Hope you have a great day. Congratulations! Steve, we weren't too bothered, just wondering what the hold up was- we never did find out. I know if we had only one sausage bread it would have been eaten, but thankfully they made two and we brought the second one home. Texican, I'm honoured and almost speechless. Not quite- I mustered enough words to tell Mater all about it. I've never, ever got anything like this before. Back when I started my blog, having people comment or even being tagged was a privilege! This means a lot. Thank you- this is too wonderful. My goodness... thank you! I wanted to ask you about the sausage bread, too. And if you have a recipe. I'm not sure exactly what it is, but it sounds yummy. I liked the entire story, but the sausage bread part is the kicker. Tangobaby, it is yummy. 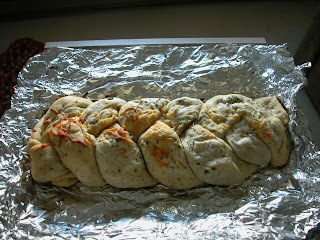 I don't quite know what they do- as far as I can tell they make a simple dough, divide it into three strips, braid the bread over some sausage, and put onion and things (anything you want, I suppose) in it and then bake it with cheese on top. I'll do my best to get the exact recipe and I'll share it. Uh-oh. The "make a simple dough" part scares me. I can cook, but I know my limitations as a baker. Ever see the I Love Lucy episode where she makes bread? That would be me. Maybe I can cheat and get ready made dough? I'll still give it a shot if you find a recipe! We have a bread maker which we make dough with so it's easy for us to cheat and call it simple! I have only seen one Lucy show in my life, and John Wayne was in it. Nothing to do with making dough at all :) But I can picture it. I used to have a bread machine too. It was like the ultimate room freshener. I used to bake bread just to smell it, not even to eat it! "Lucy even tries her hand at baking homemade bread." That's a good picture, probably captures the hilarity of the scene. I'll check out some episodes then. "I used to bake bread just to smell it, not even to eat it!" Just like Spouse and I- there's nothing like the smell of bread. Oh. My. Goodness. I really loved this post! I am so glad that I found my way back to you. I have been here some time ago, but somehow, I didn't save the link. Anyway, am very glad to be back, and what a welcome. 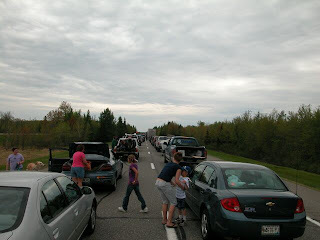 Your story reminded me of our memorable traffic jam experience about 15 years ago. We were on Mont Eagle mountain between Chattanooga and parts north when there was an accident. We all did the same as your recent stop: stretched, chatted, shared snacks. Unfortunately, no singing. Our stop was long, but luckily, a generous couple with an RV was nearby so my nephew and I didn't end up hiking up the mountain to pee in the bushes. Thanks for the good memory. i don't braid it, but make a horseshoe shape, but it could easily be braided. so glad you included a picture of it! :-) before it was gone! Relyn, I'm really very glad you made your way back here! Thanks for that story about your own road trip- it's good to hear about things like this. The news media won't print them or show them on TV and so we tend to get this idea that people are not very good anymore. I'm glad you didn't have to go into the bushes- we did happen to notice some people doing that during our unexpected stop. They had no choice. Julie, thanks for that link to the post- I'll go and check it out and see how it is and how/if it differs. We found that the bread is better when toasted up slightly rather than cold. I promise everybody to do what I can to get that recipe.